Historical moment: Fr Chris Hanlon at the launch of the Knights of the Southern Cross Queensland’s history book. Historical moment: Br Tim Scott, Archbishop Mark Coleridge and Fr Chris Hanlon at the launch of the Knights of the Southern Cross Queensland’s history book. 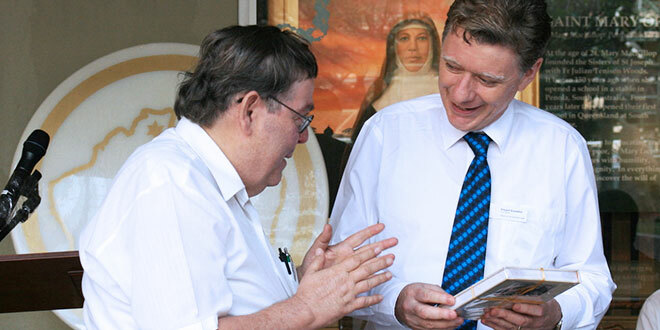 BRISBANE priest Fr Chris Hanlon thought he knew everything about his father’s life until he started supervising a history book project over the past two years. 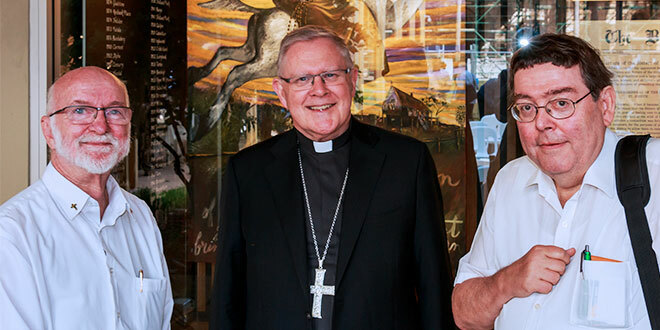 Fr Hanlon, who is as Church historian for Brisbane archdiocese, was asked to supervise and contribute to a book detailing the history of the Order of the Knights of the Southern Cross in Queensland. It was during the collaborative project that Fr Hanlon discovered documents detailing his own father’s membership in the Australian fraternal society. Fr Hanlon said his father had mentioned joining the order in his younger years, but was relatively quiet about his involvement at home. “All of a sudden I realised who all those people were mixing with my father on our back veranda,” Fr Hanlon said. Fr Hanlon’s research also answered a burgeoning question about two unfamiliar medals that were with his father when he died about 20 years ago. “He had a couple of medals next to his bedside table when he died at the nursing home,” Fr Hanlon said. “I found out while working on this book, they were medals from the knights. Fr Hanlon was one of two Catholics with qualifications in Church history supervising the writing of the history of Australia’s knights. Titled A Quest for a Fair Go – A history of the Knights of the Southern Cross 1921 to 2015, the book goes into detail about the early days of the order. Launched in October by Archbishop Mark Coleridge, exactly 95 years to the day since the order started in Queensland, the book is an account of the knights’ work between 1921 and 2015. Research: Knights of the Southern Cross State Chairman Vince Granahan and Fr Chris Hanlon. The knights’ state executive officer David Jefferies said the order started as a response to the growing religious discrimination Catholics faced in the workforce. “Catholics couldn’t get work because of the bigotry and antagonism in society towards Catholics,” Mr Jefferies said. The order officially established in 1919 at the approval of Archbishop Michael Kelly, the knights’ first spiritual advisor. On October 29, 1921, the order’s first Queensland meeting was held across from St Stephen’s Cathedral at St Stephen’s School, now known as Mercy House. Fr Hanlon said the social justice aspects of the order were secondary to members’ involvement in public devotions and processions, and their loyalty to the local bishop. “If there was a Rosary crusade, or if Our Lady of Lourdes’ statue was coming to Australia, chances are you would find the knights in the organising team, even if just in crowd control,” Fr Hanlon said. In recent years, the knights in Queensland have focused on working with refugees, life issues, and aged care through Southern Cross Care, as well as assisting the bishops of the Pacific regions. The order has also produced a pocket-sized prayer book for members of the Australian army. 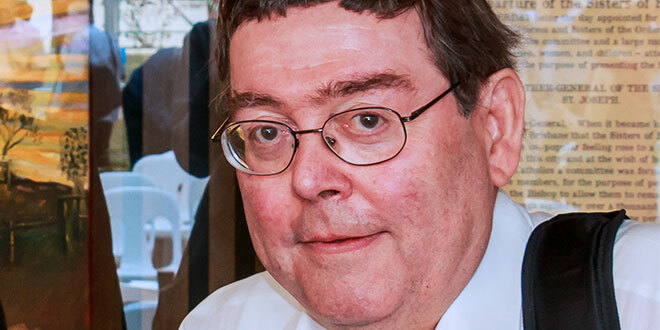 Mr Jefferies said the needs of the Pope and bishops had led their focus on the marginalised, taking up the Holy Father’s “field hospital approach”. Archbishop Coleridge said while there had been numerous changes in the knights and in the Church in the past 95 years, four aspects had not changed. These included a personal faith in Jesus Christ, a love for the Church, service to the needy, and courage in their religious convictions that propelled fighting for their beliefs. While membership in the order is aging, there are several young men joining the order as new knights. Mr Jefferies hoped the new book would inspire more Catholic men to join the fraternity. “This is a renewed push to make the knights better known,” Mr Jefferies said.